When we think of puppets, a few things come to mind. Jim Henson. Ventriloquism. Sock puppets. Puppet takes the chance to challenge the misconception of what is normally perceived as merely children’s entertainment. Puppetry has been a creative art of storytelling for centuries, to tell many stories through lifelike figures. Director David Soll intertwines the history of puppetry with the staging of the show Disfarmer, by puppeteer Dan Hurlin, about the nearly-obscure Depression-era portrait photographer Mike Disfarmer. 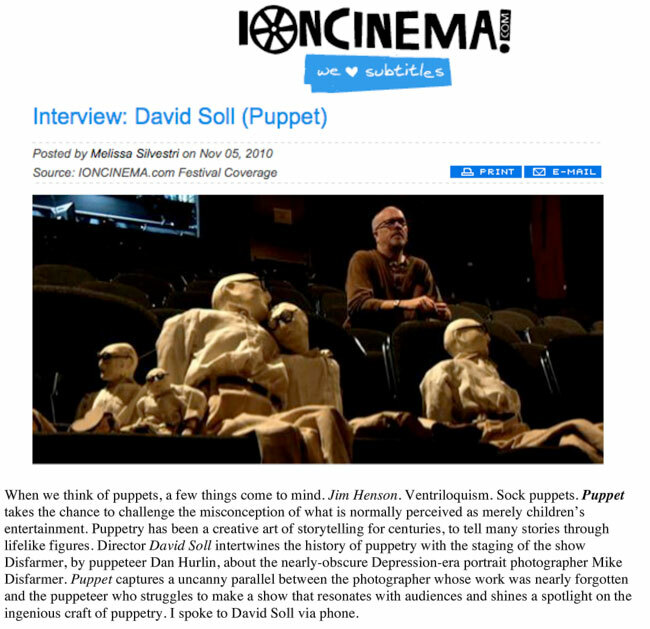 Puppet captures a uncanny parallel between the photographer whose work was nearly forgotten and the puppeteer who struggles to make a show that resonates with audiences and shines a spotlight on the ingenious craft of puppetry. I spoke to David Soll via phone. Melissa Silvestri: How did you get involved in Puppet? David Soll: Pretty simply actually. I saw the show. I read David Rakoff’s article in the New York Times previewing Hiroshima Maiden [Dan Hurlin’s previous show]. I went to see that show, not knowing what to expect. It had never occurred to me that puppetry could be for adults. My only reference point was The Muppets and Sesame Street. I had no idea that in every other country in the world, puppetry was either high art or religion or folk craft, and it was only in America that this had been marginalized as children’s theatre. So this was completely new to me. And [it was] the unexpectedness of seeing such a moving piece, done with subtly and nuance as a puppet piece, combined with Dan’s exquisite aesthetic. [It] just really inspired me and thrilled me. And I didn’t do anything about it, until I met Dan by chance. And I told him how much I loved Hiroshima Maiden. And he told me about his upcoming piece, Disfarmer. And he told me the story of Disfarmer, and I said to him, “It seems to me that there should be a much larger audience for this work than there is,” and I would come up to his church where he was having his first rehearsal residency. He would bring these puppeteers up from New York City to work with him in this church. And once I saw them operating the puppet, looking at it through the camera, I couldn’t really resist. It was such a compelling image to see a close-up of the puppet being operated by these three extremely talented puppeteers. Silvestri: There is a way that these puppeteers bring life to these creations that make the puppets very lifelike and emotions are projected onto them, despite their fixed expressions. Soll: That’s absolutely right. I’ve spoken to the puppeteers, [and] they describe their role as facilitating a connection between the audience and the puppet. So while they are performers, and they recognize that they are performers, there’s a certain immediate connection that people have with the inanimate object, that once it has just the slightest amount of life breathed into it, [it] captivates, and really inspires an audience to connect, and bring all of their own emotions into the scene. So the puppeteers just see themselves as really enabling that primordial connection. Silvestri: Audiences may be turned off to puppetry because of a fear of puppets, of something inanimate being given human emotions and feelings, and almost coming to life. Soll: There are definitely people who find puppets creepy. But I think it’s the robotics theory, from the late 70s, [that] has become really popular, as with 3-D animation, the uncanny valley, this notion that a human simulacra, [like] an animated figure or a puppet, as it approaches lifelike, it reaches a point where it’s almost human, but not quite, and it goes from being amusing and engaging to uncanny and terrifying. And that was the theory behind why The Polar Express as a film did really badly at the box office, because they were too lifelike but not quite lifelike enough. As something gets too close to being lifelike, the audience starts to focus on the ways that it’s not alive, and get revolted, rather on the ways that it is alive, and be delighted. So I think puppets, when they’re done well, exist right on the edge of the uncanny valley where they’re completely compelling, but not quite uncanny. Silvestri: The slow acceptance of a puppet as an lifelike creature reminds me of Todd Haynes’ Superstar, which allows the audience to initially get past the absurdity of Barbie and Ken dolls acting out a story and feel emotions for the story via the voice acting and music, projecting their own emotional responses onto the plastic faces. Soll: I think that’s right. It’s really a tricky line between being boring, because they’re just dolls, and being completely captivating, and being revolting. The difference between those three categories is really pretty subtle, I think. And you’re not really sure how or why that line gets crossed. Silvestri: I had seen an exhibit of Disfarmer’s work at a Manhattan gallery [Steven Kasher Gallery], I was curious to know if Dan related to Disfarmer in being a misunderstood artist? Soll: I don’t think Dan was entirely sure why he wanted to make a piece about Disfarmer at the beginning. He thought he was fascinating, but I don’t think he started out seeing himself in this puppet. That’s something that evolved for him over time. And I don’t think it’s necessarily about feeling unappreciated it was more about connecting to someone for whom issues of legacy and mortality were really salient. So for Dan, it’s more like the life in his show. He spent three years making this project with collaborators, investing with enormous personal, emotional and creative resources into it, and when it’s over, it’s just gone forever. And that to me, just in terms of any performance art or theater, is really terrifying. As a filmmaker, I want to make things that will last. That’s just something that I’m attached to, and I don’t know how people like Dan Hurlin do it, and invest so much time and energy into something that when it’s over, it’s really gone. So the least that he’s hoping for is a really significant run where he gets to feel like a lot of people saw it, that it made its mark on theater, that it did something. That it had a life in the world. So he chose as his project this story about a man who had done incredible work, completely outside the New York art world, completely unknown to the art world, and then passed away completely in obscurity. And only thirty years later did his work find its own new life, completely separate from him as a human being. There was something about that overlap and intention. Silvestri: Disfarmer’s photographs show people who have strong, stoic expressions, and whose backgrounds are completely mysteries, that you can project whatever kind of background you want onto them. Soll: Absolutely, and that was Dan’s first epiphany when making his piece, that was he was drawn to these photographs the same reason that he was drawn to these puppets, and the same reason that he was drawn to Disfarmer, that they all invite that kind of interpretation. And they also feel like they just barely exist. They’re there enough to captivate your imagination, but you don’t know anything about them. We don’t know anything about Disfarmer. We just know that he was an eccentric guy who took amazing photographs, so he’s just there enough to inspire an evening performance, but not enough to tell you the whole story. The Wikipedia entry on Disfarmer’s life is pretty short [laughs]. There’s just not much there. Silvestri: The documentary gives audiences a wider view of the art of puppetry, beyond children’s theater or hand puppets. The puppetry in work like The Lion King expands an awareness that puppetry can be more alive and one with the performer or work as a support to an artist rather than being the star itself. And that puppetry is more respected in other countries as a legitimate art form rather than the U.S., where it is demoted to only being for children, and not high art enough for adults. Soll: I’m glad to hear that that comes across. And what I was hoping to do was not just make it a lot of context for this guy [Hurlin], but have Mike Disfarmer, Dan Hurlin, and the form of puppetry as three intertwining threads, which have these overlapping themes of disappearance and revival. All three experience issues of disappearance and legacy and marginalization, and I was hoping to find a way to put those three in dialogue with each other.